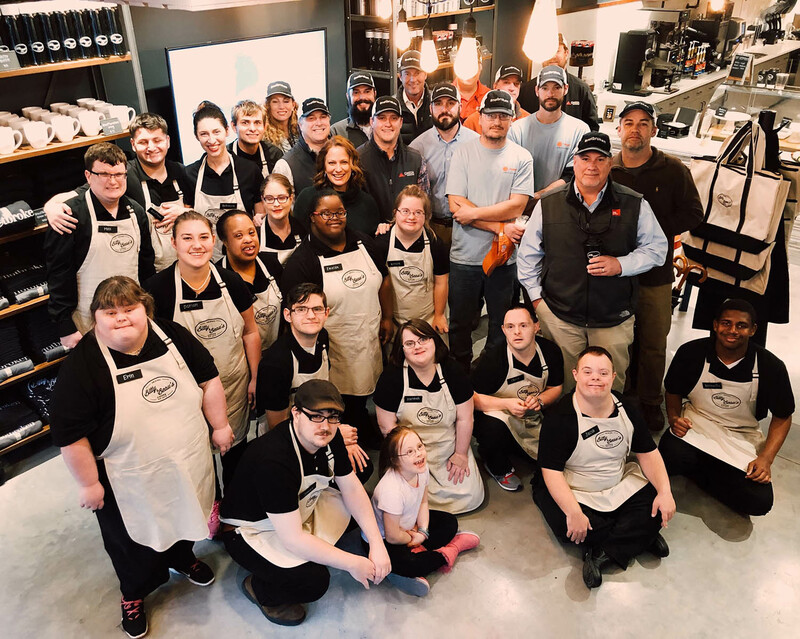 SAVANNAH, GA, January 14, 2019—Omega Construction celebrated the opening of Bitty & Beau’s Coffee, located at 319 W. Congress St., with a Subcontractor Appreciation Event on Friday afternoon, ahead of the shop’s Grand Opening and Ribbon Cutting Event which took place on Saturday morning. Omega was the General Contractor for Bitty & Beau’s Savannah location and even with a fast-tracked project schedule and tight budget constraints, all targets were met by Omega’s dedicated construction team. Friday’s event was a token of appreciation from Omega, which gave each of the project’s Subcontractors a hat featuring Bitty & Beau’s social media hashtag, #notbroken, to spread awareness that people with disabilities are not broken and are vibrant members of the community. Amy Wright, Bitty & Beau’s owner and 2017 CNN Hero of the Year, has two children with special needs and founded the company to employ people with Intellectual and Developmental Disabilities (IDD), allowing them to earn a paycheck, gain a sense of pride, and show that they are capable members of today’s workforce. Omega Construction, Inc. is a privately owned General Contracting firm headquartered in Winston-Salem, NC serving the construction needs of the Southeast for over 40 years. Omega’s portfolio includes Industrial, Hospitality, Commercial, Retail, and Historic Preservation projects. Their Georgia office was opened in 2014 and hired Todd Mayo to manage the Georgia Division in 2018. Omega Construction’s Georgia Office is located at 2801 US HWY 17 South, Suite 100, Richmond Hill, GA 31324. Call 912-480-0135 or visit www.omegaconstruction.com for more information.